Western blot analysis of whole cell lysates probed with cytokeratin 5 antibody (VMA00119) followed by detection with HRP conjugated Goat anti Mouse IgG (1/10,000, STAR207P) and visualized on the ChemiDoc™ MP with 5 second exposure. Arrow points to cytokeratin 5 (molecular weight 62 kDa). Cytokeratin 5 antibody recognizes the keratin type II cytoskeletal 5 protein, also known as 58 kDa cytokeratin, CK-5, epidermolysis bullosa simplex 2 Dowling-Meara/Kobner/Weber-Cockayne types, keratin 5 or type-II keratin Kb5. Mouse anti Human cytokeratin 5 antibody recognizes cytokeratin 5, also known as 58 kDa cytokeratin, CK-5, cytokeratin-5, epidermolysis bullosa simplex 2 Dowling-Meara/Kobner/Weber-Cockayne types, keratin 5 (epidermolysis bullosa simplex, Dowling-Meara/Kobner/Weber-Cockayne types), keratin, type II cytoskeletal 5 and type-II keratin Kb5. Encoded by KRT5, cytokeratin 5 is a member of the keratin protein family. The type II cytokeratins consist of basic or neutral proteins which are arranged in pairs of heterotypic keratin chains coexpressed during differentiation of simple and stratified epithelial tissues. This type II cytokeratin is specifically expressed in the basal layer of the epidermis with family member KRT14. Mutations in these genes have been associated with a complex of diseases termed epidermolysis bullosa simplex. The type II cytokeratins are clustered in a region of chromosome 12q12-q13 (provided by RefSeq, Jul 2008). 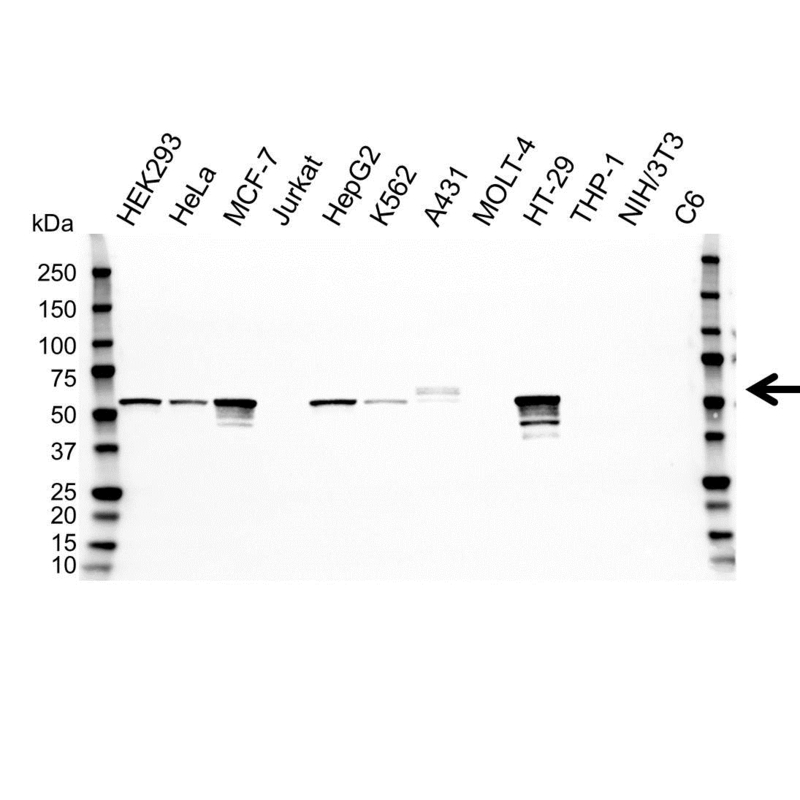 Anti cytokeratin 5 detects a band of approximately 62 kDa in HEK293 cell lysates.